Our little girl turned 7 months old last week. She has grown so much and is changing every day. I take a monthly picture of her to document her growth and to have a way to look back and see how much she has changed. This month was the hardest "photo shoot". I couldn't get her to look at the camera, smile, stay in one spot and she was determined to eat that red piece of paper!! This was the best picture I could get but that is okay she is still cute and we love her very much. Check out her pictures from previous months here and here. 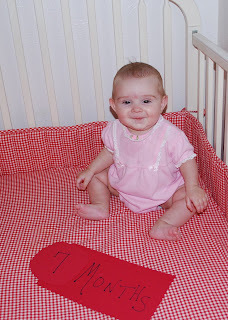 Here are seven fun facts about our growing little girl. She still LOVES her paci and has now learned to put it back in her mouth..sometimes sideways. She may not weigh very much but she has the fatest thighs I have ever seen. They require Desitin. She has been saying "Mama" since she was 5 months and that makes "Mama" very happy. She has many tricks using her tongue and we wonder if Gene Simmons may be in our family tree. She will only giggle for Cole and at this point still adores him. She lights up when he comes around. She loves SLEEP!!! She still takes 3 naps and sleeps through the night!! Lets hope she keeps it up. She is very good at imitating motorboats and cars. She may be a tomboy after all.